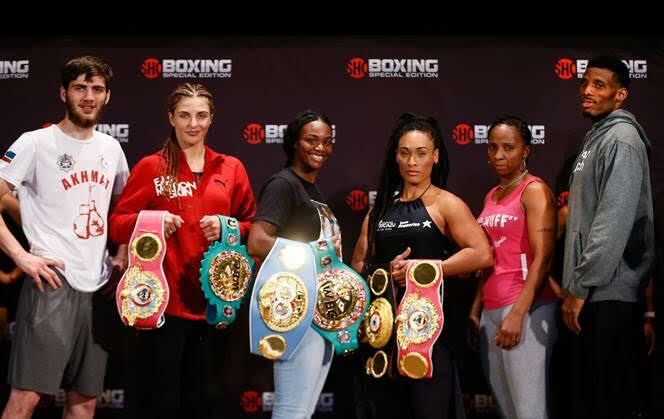 Claressa Shields – 159 ½ lbs. Hanna Gabriels – 159 ½ lbs. Christina Hammer – 159 ½ lbs. Tori Nelson – 157 ½ lbs. Umar Salamov – 174 ½ lbs. Brian Howard – 174 ½ lbs. NOTE: see PDF email attachment for bout sheet and all weights. “I have John David Jackson now and I’ve learned so much from him since we got together back in February. I’ve had coaches in the past who tried to change my style and game, but at the end of the day I just have to go in there and fight like I know how to. “Being in Flint for my last camp, you wouldn’t believe all the things I had to deal with. Just stuff that shouldn’t be happening to a world champion. It was stressful, and I was stressed even the week of the fight [in January]. I had to get out. I was able to train in Florida this time around. “[Hanna’s] a good fighter. She has skills and just the way she carries herself. She’s very calm and her facial expressions never change. I watched the fight where she got knocked out, and even then her facial expressions didn’t change. I think she’s tough, but not as tough as I am. I know I’m the better fighter. “Tori underestimated my power. I think Tori has a punchers’ chance [against Hammer]. I don’t wrap my career around Hammer. Our lives don’t intertwine. I have to worry about what’s in front of me. I’m not going to watch that fight. “We need to step up to the plate and make sure our game plan is on point and we give the fans what they want to see, which is a great fight. You have to overcome a lot and sacrifice to get to this point, and my team has done that. “I’ve never feared anyone. Words don’t do anything. When I get in the ring I’m going to be a beast. “I’m OK with whatever comes, win or loss. I’m a champion and that’s my mentality in the ring. We’re going for the victory, and I’m appreciating everything that’s happening preparing for this fight. “I was very disappointed that I wasn’t able to fight back in January because of my visa issues. “I was at the Claressa Shields-Tori Nelson fight and now it’s my turn to get in the ring. I like to go forward and be aggressive. When you can finish, you finish. The American people will like my style. “I’m a power puncher and I’ve been using my legs more in camp so this camp has been so much different than what I’m used to. “They say lighting strikes only once, but I got another chance. I am so grateful I got the call for this fight. This is my second chance. A lot of people don’t get second chances. ‘I really have something to prove. A lot of people have believed in me and I’ve got to show what I can do in the ring. “This fight is going to be a good test. I know I can make it into the top 10, and this is my start. “There’s a big difference living here in Detroit, but it’s a lot like Moscow, a big city. “I have a little bit of ring rust, but I’m going to be sharp. I’ve prepared well and I’m in shape. I have great metabolism, and can lose weight easily. “I took my first loss in 2012 and after I took that loss I didn’t have the support I needed. I got back into it and it was just tough getting a fight. I got a lot of nos. “I’ve seen some tape of my opponent. But you don’t know if he will change or bring something else. “I box better than I play football. My nickname is MVP – Most Vicious Puncher.